You might be wondering why on earth anyone would want to purposely ROUND UP a bunch of rattlesnakes. After all, most people do their best to avoid them. But if you're a rancher or farmer in Sweetwater, Texas who lose cattle to these vipers, you look forward to getting rid of as many as possible. Since 1958, the World's Largest Rattlesnake Round-Up has been held annually on the 2nd weekend in March at the Nolan County Coliseum. 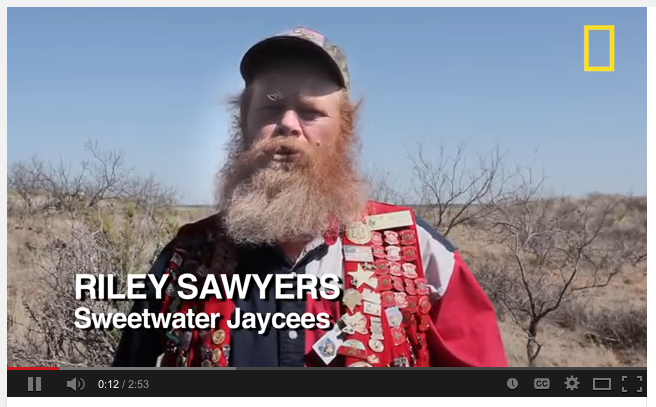 The Round-Up was started as a way to control the population of snakes in this area of Texas, and has turned into a popular annual event sponsored by the Sweetwater Jaycees. Today, the Rattlesnake Round-Up draws over 40,000 visitors per year and is fun for the whole family. You can expect a Snake Safety Demonstration , Fried Snake Meat, Vendors of all kinds, a Carnival, Flea Market, a Miss Snakecharmer Pageant, a Gun Knife & Coin Show— lots of things to see and do. But even with all the other things going on, the rattlesnakes are the main attraction. Bus tours take people out on tours so you get a feel for the rattlesnake's habitat. It's really educational! The Jaycees purchase about 5,000 pounds of rattlesnakes each year from private hunters who trap them. Not to worry, as you'll see in the video, everyone coming into contact with these fearsome creatures uses snake bite protection such as snake chaps and long-handled snake hooks. After being "rounded up" the venom is removed from each viper. Then they are weighed, measured, and sexed. The data is used by the wildlife department. The rattlesnakes then literally lose their head, but nothing is wasted. The hides are used for wallets and belts and other decorative items. The meat becomes part of the BBQ menu that Texas is known for. If you've never been to Sweetwater, the city is located in Nolan County, 40 miles west of Abilene, 75 miles north of San Angelo, 125 miles southeast of Lubbock, 130 miles of Odessa and 190 miles west of Ft. Worth. The landscape is predominantly rolling uplands to the north, with plateaus traversed by valleys in the south. The agricultural economy centers around cattle and live-stock products, but 50 percent of the annual agricultural income is from crops, especially cotton, wheat and sorghum that favor loamy soil. Wind power is fast becoming an alternative energy source of choice— Nolan County is one of the Top 10 largest wind farms in the United States. If you like history, you'll enjoy the stories that put Nolan County on the map. The first Anglo settlers, mostly buffalo hunters, came to the area after the Civil War. Knight's store on Sweetwater Creek was started in a dugout in 1877 to serve the buffalo hunters . The county's first post office was opened in 1879 in the village of Sweet Water, which was two words until the spelling was officially changed in 1918. The original name of the post office was Blue Goose, derived from a story that the first postmaster ate a blue crane that cowboys told him was a blue goose. The townsite was on the Texas and Pacific Railway, which had built into the area in March 1881. The first newspaper was published that same year. If the World's Largest Rattlesnake Round-Up sounds oddly interesting and you would like to learn more about the snakes and safely see them close up, mark your calendars and visit Sweetwater, Texas next year. The event is always held the second weekend of March.